It is widely accepted within the literature on substance abuse disorders that problems with addiction tend to run in families; individuals who grew up with parents who struggled with addiction are more likely to also have problems with addiction themselves later on in life. 1-3 This predisposition to developing an addiction disorder can be accounted for by the interaction of both environmental and genetic factors. In family studies, occurrence rates of a disorder within members of a family are examined. While this provides a nice estimate into how often an addiction might occur in a family, it does not account for the role of the environment. 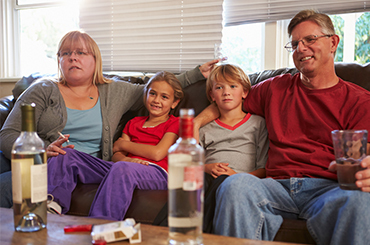 While genetic influences may be at play, factors associated with growing up in a home with an addicted parent, exposure to the addictive substance and other addictive behaviors, and shared familial beliefs about the substance and addiction will also shape the child's inclination towards substance abuse. In an effort to better isolate and examine the factors related to the genetic transmission of addiction, studies using twins and children who have been adopted have been employed. 4 Generally, results from these studies indicate that heritability rates of addiction disorders range from 0.39 for hallucinogenic drugs to 0.72 for cocaine. 5 Findings from a study exploring families of twins indicate that early initiation of substance use, which may contribute to the development of an addiction disorder, is most strongly predicted by factors relating the family and social influences. 3 Further, first-degree relatives (i.e., a sibling, parent, or child) of someone with a history of addiction are between 4 to 8 times more likely to develop problems with addiction themselves when compared to those who do not have a family member with an addiction. While genetics are a critical component to the development of problems associated with addiction, the environment also plays an important role in this risk. 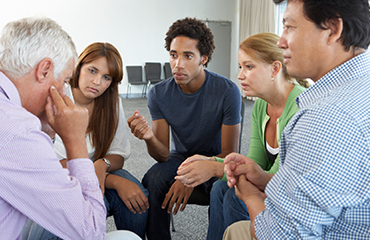 There are many ways in which growing up with a parent or parents who are addicted to substances may influence one's vulnerability to the disorder. Depression or anxiety: Adult children of addicts are more likely to suffer from symptoms of anxiety and depression, likely because they failed to learn effective methods for managing their emotional responses during childhood. Constriction of emotions: Adult children of addicts have a tendency to shut down or block out their emotional responses to situations, as a way of dealing with feelings of overwhelming pain. They exhibit a restricted range of affect and lack abilities in the authentic expression of emotions. Distortions with reasoning abilities: Adult children of addicts often make convoluted attempts to explain, understand, and make meaning of difficulties that seem senseless to others. Lack of trust: Individuals of addicted parents often do not know how to trust others, given their history of disrupted and insecure attachment to an addicted caregiver. Hypervigilance: Adult children of addicts often worry excessively about potential danger or catastrophe. Lack of abilities in self regulation: Adult children of addicts often exhibit dysregulated affect and emotion, owing to impairments within the limbic system and prefrontal cortex. 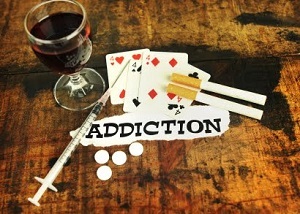 Tendency toward addiction: Adult children are more likely to choose to self-medicate with substances, therefore predisposing them to developing problems with addiction. McGue M, Iacono WG, Legrand LN, Elkins I. Origins and consequences of age of first drink. II. Familial risk and heritability. Alcoholism Clin Exper Res 2001;25(8):1166-1173. Dinwiddie SH, Reich T. Genetic and family studies in psychiatric illness and alcohol and a drug dependence. J Addict Dis 1993;12(3):17-27. Meller WH, Rinehard R, Cadoret RJ, Ton ET. Specific familial transmission in substance abuse. Int J Addictions 1988;23(10):1029-1039. Urbanoski KA, Kelly JF. Understanding genetic risk for substance use and addiction: A guide for non-geneticists. Clin Psychol Rev 2012;32:60-70. Bevilacqua L, Goldman D. Genes and addictions. Clin Pharmacol Ther 2009;85(4):359-361. Buscemi L, Turchi C. An overview of the genetic susceptibility to alcoholism. Med Sci Law 2011;51(Suppl 1):S2-6. Enoch MA. Genetic influences on the development of alcoholism. Curr Psychiatry Rep 2013;15(11):412. Mirin SM, Weiss RD, Griffin ML, Michael JL. Psychopathology in drug abusers and their families. Compr Psychiatry 1991;3236-3251. Cservenka A. Neurobiological phenotypes associated with a family history of alcoholism. Drug Alcohol Depend 2015:[Epub ahead of print]. Merikangas KR. The genetic epidemiology of alcoholism. Psychol Med 1990;20(1):11-22. Clarke TK, Nymberg C, Schumann G. Genetic and environmental determinants of stress responding. Alcohol Res 2012;34(4):484-494. Gruber KJ, Taylor MF. A family perspective for substance abuse: Implications from the literature. J Soc Work Prac Addiction 2006;6:1-29. Johnson JL, Leff M. Children of substance abusers: Overview of research findings. J Pediatrics 1999;103(5):1085-1099. Dube SR, Anda RF, Felitti VJ, Croft JB, Edwards VJ, Giles WH. Growing up with parental alcohol abuse: Exposure to childhood abuse, neglect, and household dysfunction. Child Abuse Neglect 2001;25:1627-1640. Nodar M. Chaotic environments and adult children of alcoholics. Professional Counselor 2012;2(1):43-47. Harter SL, Taylor TL. Parental alcoholism, child abuse, and adult adjustment. J Subst Abuse 2000;11(1):31-44. West MO, Prinz RJ. Parental alcoholism and childhood psychopathology. Psychol Bull 1987;102:204-218. Liebermann DZ. Children of alcoholics: An update. Curr Opin Pediatr 2000;12(4):336-340. Kearns-Bodkin JN, Leonard KE. Relationship functioning among adult children of alcoholics. J Stud Alcohol Drugs 2008;69(6):941-950. Buckland, P. R. (2008). Will we ever find the genes for addiction?.Addiction,103(11), 1768-1776. Deng, X. S., & Deitrich, R. A. (2008). Putative role of brain acetaldehyde in ethanol addiction.Current drug abuse reviews, 1(1), 3.